Are non-dairy milk alternatives sustainable? Walk down the aisle in any supermarket or whole-foods store these days and you'll encounter a myriad of choice when it comes to non-dairy milk alternatives. Soy, rice, almond, coconut and more. Organic or inorganic? But which one do you choose especially when it comes to sustainability? There are several things to consider when it comes to sustainability, water footprint (how much water used), carbon footprint, how the base ingredient is farmed and so on. Considering these factors, let's have a look at how some non-dairy alternatives compare. A staple in many Asian cultures, traditional soy milks can be made from the whole bean, as a dairy type milk or as a soy beverage. Most soy milk in Australia is made from imported soy protein or soy isolate rather than the whole bean. The US, Brazil and China produce most of the world's soybeans. They are a great source of protein, calcium and other nutrients. In terms of how much water is used varies depending the soy milk product produced. Soy typically uses 28% the amount of water used for dairy production. However soy needs reliable moisture to grow so typically farms are located on the coastal areas of Australia and some inland parts of Victoria. It takes approximately 9500 litres to produce a tonne of soy beans and 297 litres of water to produce 1 litre of soy milk. Inorganic soy bean farms have a higher water footprint than organic due to irrigation. There are locally made whole bean organic soy milks on the market so it pays to read the carton. 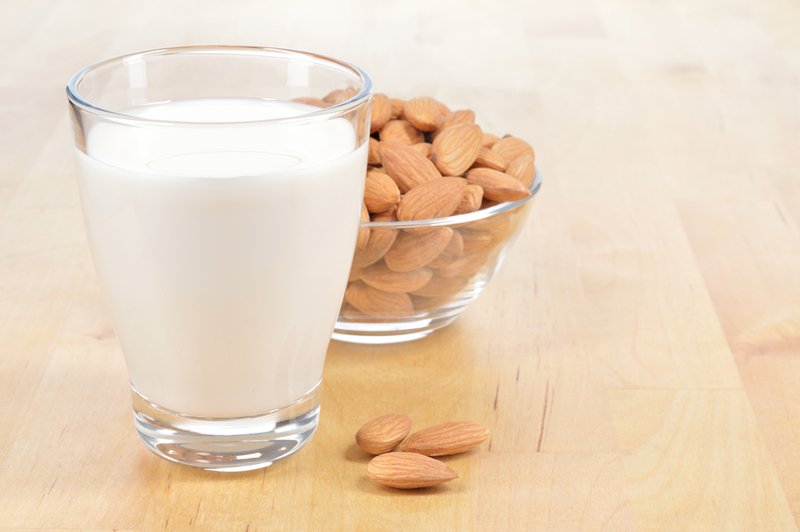 Used for many years in the Middle East and Mediterranean regions, almond milk is fast becoming a popular alternative to dairy and for those allergic to soy. Like soy, it can be used in cooking as a dairy replacement and has a lighter taste so it's great for cooking all things sweet. Almonds have excellent nutritional properties and it's very easy to make your own almond milk at home. 82% of the world's almonds are grown in California with majority of the nuts for almond milk produced in Australia sourced from there. Almonds need to be watered all year around and it takes approximately 4.1 of water to produce a single almond, with 3.8 million litres used per acre of almond trees. Plus they have to be freighted here. There are locally grown/made organic almond milks available, so something to consider versus the imported options. 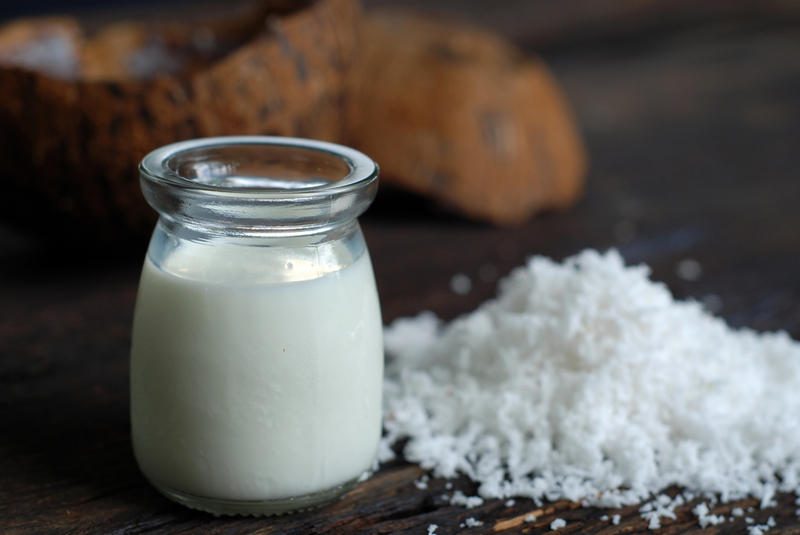 High in nutrients, coconut milk is made from the flesh of the coconut. The milk is produced by cooking coconut flesh in hot water, the cream floats to the top and is skimmed off. The remaining liquid is then filtered or refiltered depending on consistency needed. However it is high in saturated fat (500 calories per cup) compared to other non dairy alternatives so perhaps it is a good non dairy alternative to have every other day rather than every day. Coconuts are grown in sub tropical/tropical areas in over 80 countries globally including Australia, where farms are located in North Queensland and some parts of Northern NSW where rain is more likely. Coconut farming also requires less water and land compared to soy, rice and almond milks. Rice is one of the most thirsty and concentrated crops farmed on the planet. It constantly needs water to grow. 1kg of rice requires approximately 3000 litres of water. Then more water again during the milk production process so rice milk has a large water footprint compared to other non dairy alternatives. New species of rice have been developed to reduce the intensity of farming practices unfortunately they are GMO, so organic is still the way to go. The milk is produced by pushing boiled strained rice through a mill. 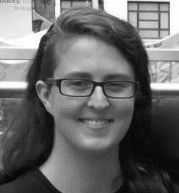 Thickening agents and vegetable oils may also be added during commercial production. However, rice milk is great for those who suffer from allergies to soy and gluten. Ultimately when it comes to shopping for sustainable non-dairy alternatives, local organically grown and produced is the way to go. It means that your milk has the least amount of carbon and water footprints possible, the crops grown have had the least amount of chemicals sprayed (if at all) and are not genetically modified. Plus it also ensures the local industry can thrive and expand. Trim dairy by equal to two glasses of milk a week if you consume a lot.